Several areas around the city saw flooding with knee-deep water as crews worked overnight to find and unclog storm drains. 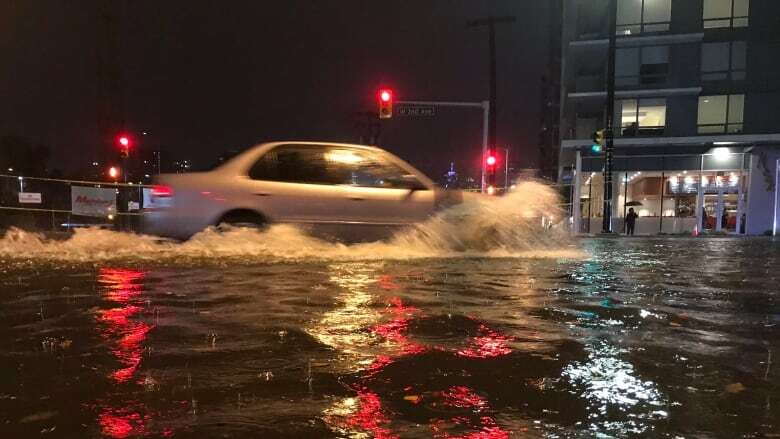 Heavy rainfall overnight led to spots of localized flooding on Metro Vancouver roads, resulting in stranded cars and more than 120 calls for assistance to the city officials. The flooding started Sunday night, as up to 25 millimetres of rain fell in Richmond and Vancouver over just two hours. 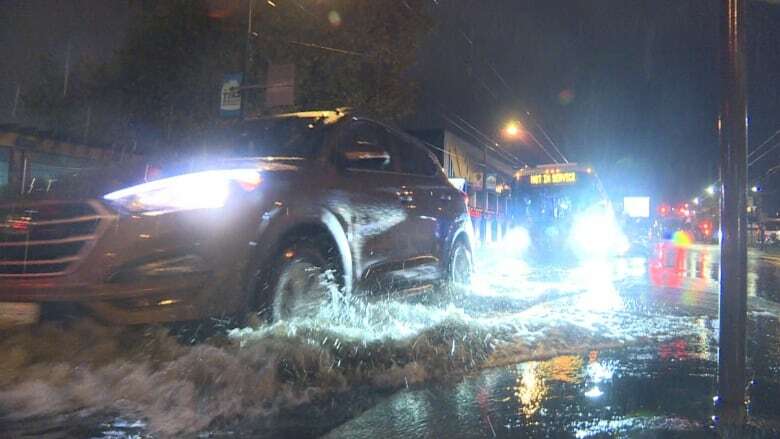 Several intersections in Vancouver ended up covered with water nearly 30 centimetres deep on the roads and sidewalks. Columbia Street near West 2nd Avenue and Hastings Street near Clark Drive were hit particularly hard. Several drivers were forced to abandon their vehicles after they stalled in the middle of massive puddles. "The water got so deep it started to go up over the floorboards in some of the cars," said Jerry Dobrovolny, general manager of engineering for the City of Vancouver. "I'd caution people: If you see a big puddle in the middle of the road, don't try driving through it." There were also reports of heavy flooding in the Olympic Village, as well as in parts of Richmond. On Monday, Dobrovolny said the "extreme" rainfall was "quite a start" to the fall rainy season. "Many of the catch basins get plugged with leaves," he said. In total, the city received 128 calls for flooding overnight. Dobrovolny said most had been attended to by 10 a.m. PT, with the city dispatching all of its overnight crews as well as extra equipment. Officials still faced questions about preparedness on Monday, given that Vancouver has seen mostly sunshine for the past several weeks — but Dobrovolny said crews were on top of it. "While many of us are out enjoying the good weather, we take that opportunity to do preventative maintenance," he said. "[But] we still have a ways to go." Dobrovolny said the first of three "early collections" of fall leaves is set for this week. He called on the public to help clear storm drains that have been clogged up when they can. "In many cases, it's as simple as a handful of leaves that have blocked a catch basin. They may have just flowed there 10 minutes before the heavy rains started," he said.